The Nubben exhibition is part of EMMA’s series of classics presenting the work of the great names of Finnish Modernism. Lars-Gunnar Nordström (1924-2014) was one of the leading pioneers of non-representational art in Finland. His art, Concretism, is characterized by an extremely precise, finished, deliberate visual expression. 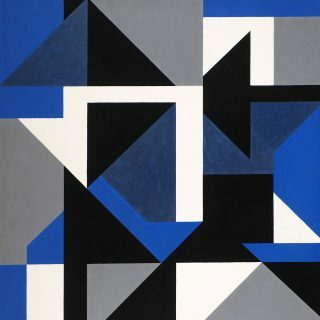 Nordström is particularly known for his geometric paintings, in which angular and curved flat colour fields form clear, strong, dynamic compositions. His production consists mainly of graphic prints, paintings and sculptures. 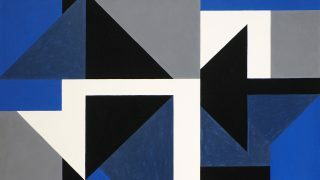 EMMA’s exhibition spaces will provide Nubben’s art − and especially his systematic series of paintings constructed out of geometric shapes – with a unique setting amid Aarno Ruusuvuori’s modernist architecture. Nordström began his career in the 1940s and, very early on, created his own distinctive Concretist mode of painting, founded on a whole made up solely of line, colour and surface. In the 1950s, he made a crucial contribution to the breakthrough of abstract art in Finland and, already then, also began making large mural paintings that reflected his interest in collaboration, in combining visual art and architecture. Nordström established his position in the 1970s, and enjoyed widespread admiration in Finnish art circles, where he was generally known by the nickname ‘Nubben’. He was also constantly active on an international level – travelling, making new contacts and holding exhibitions. His art has had a major impact, particularly in Sweden. Spatiality and architectonicity form the foundations of Lars-Gunnar Nordström’s art. He grew up in an architect family, studied to be an interior architect at the Central School for Applied Arts and, in the early stages of his career, worked as a designer in architects’ offices. The EMMA exhibition puts the spotlight not only on Nordström’s paintings and graphic prints, but also on his sculptural production, and the sketches and working processes that underpinned his paintings and three-dimensional work. A major role in Nordström’s life and art was played by his passionate relationship with jazz music. His collection of around 11,000 jazz albums was legendary. Music also had direct links with Nubben’s art. The EMMA exhibition sheds light on the artist’s character and personal profile, particularly through documentary material and music. Nordström not only worked as an artist, but also as an interior and stage designer, and as a writer, art critic and teacher. The exhibition is accompanied by an extensive catalogue tracing Lars-Gunnar Nordström’s life and art. In his extensive research Oscar Ortiz-Nieminen reveals new viewpoints on the artist’s life and importance at the hub of Finnish Modernism from the 1950s up to the 2000s. Other writers in the catalogue include art critic Erik Kruskopf and art historian Serge Lemoine. In 2011, the L-G Nordströmin Säätiö – L-G Nordströms Stiftelse – Foundation for Constructive Art deposited 100 of Lars-Gunnar Nordström’s works at EMMA. This was done on condition that a retrospective exhibition of the artist’s works be held at EMMA. Lars-Gunnar Nordström (b.19.8.1924) passed away on 10.8.2014, just a few weeks before his 90th birthday. This broad survey of his production, designed by EMMA, thus now has the status of a commemorative exhibition. This summer, EMMA offers a major showing of the works of Finnish ceramic artist Birger Kaipiainen (1915–1988) that is bound to question categories and raise eyebrows. During his half-century long career at the Arabia factory, he enjoyed a freedom to fulfil his creative visions untrammelled by the demands of industrial production.